From left: Elijah Cummings, Shane Pendergrass, Janet Siddiqui, Guy Guzzone, Jim Robey. Howard County legislative district maps. Massive turnover in the legislature is expected in the 2014 election, with at least a third of the 188 Maryland General Assembly seats changing, and as many as 50 members turning over in the House of Delegates alone. Nowhere is the upheaval more dramatic than in Howard County, where two-thirds of its seats are up for grabs: two of three Senate seats and six of nine delegate seats. These changes have already led to the announcement or filing of more candidates for Howard County legislative districts by non-incumbents than any other area in the state. The election opportunities are so enticing that they have even drawn the serious interest of two former delegates, Republican Bob Flanagan, who represented Howard County in the House for 16 years, and Democrat Mike Gisriel, who hasn’t yet moved into District 12. And among those running for the House seats are three physicians, including a school board member who garnered more votes in her race than County Executive Ken Ulman did in his. At the moment, there is only one doc in the legislature. Del. Gail Bates, running for Senate with Warren Miller. The scale of the changes is partly a reflection of new legislative district lines passed in 2011. The high turnover is also due to the departure of two state senators who had been secure in their seats: Jim Robey, the former Howard County executive and police chief, is retiring in District 13; and Republican Allan Kittleman in District 9 is running for Howard County executive. Two incumbent delegates, Democrat Guy Guzzone in District 13 and Republican Gail Bates in District 9, are running for those seats. On top of that, the three incumbent Democrats in District 12 — Liz Bobo, Steve DeBoy and Jimmy Malone — all decided to hang it up after redistricting placed them all in a three-member district, where more than a third of their constituents were new. And one single-member district in Howard County, 9B, is completely new. The 9B seat is the only true swing district in the county, and primaries are considered likely for both parties. The seat was ostensibly drawn to accommodate Howard County Council member Courtney Watson. But now, with Guzzone out of the race, Watson seems most likely to run for county executive. In two public speeches, County Executive Ulman has all but urged her to run. a lawyer who writes the HoCoRising blog, was recently reelected to the Columbia Association Board of Directors, which oversees all the open space, lakes, recreation and community facilities in Columbia. But he chose to announce his candidacy at the Rumor Mill in the most historic part of Ellicott City last Monday. Republican businesswoman Carol Loveless plans on announcing for the seat July 1, the day the new gas tax, tolls and property taxes take effect. She has run Quality Security Solutions, a security firm for office buildings and business parks, for 13 years. Loveless has been “very active” in the Howard County Republican Club and she was “very involved in the gun legislation” this past session. Bob Flanagan, a lawyer who was House Republican leader and Gov. Bob Ehrlich’s secretary of transportation, said, “All of these precincts are precincts I represented in the House of Delegates for 16 years,” in what was then a two-member district. He served with Del. Bob Kittleman, who became a state senator and was succeeded by his son, Allan, after his death. Flanagan is motivated by the gerrymandering that took place in 2011. “The Maryland legislature can’t afford to be more lopsided than it already is,” he said. Flanagan got 47% of the vote running for County Council against Watson in 2010. He thinks the general election will be decided by 600 votes either way. There has been a Republican named Kittleman running in Howard County in every election since 1978, and this year there will be two Kittlemans on the ballot. Trent Kittleman, Allan’s step-mother, has already filed to run in 9A for Gail Bates’ delegate seat. In 2010, Trent Kittleman challenged Ulman’s reelection for Howard County executive, and he soundly trounced her with two-thirds of the vote. But 9A encompasses all of western Howard County and is the county’s most Republican turf. With redistricting, “it became even more Republican,” said Miller, who will be running for his fourth term there. Bates said she might have a primary fight, and certainly expects a spirited primary for her old seat. Actually, voters get to choose two candidates, so Miller is involved in the fight as well, but with two-and-a-half terms already under his belt. Bates and Miller will run as a ticket, with the voters left to decide the Republican that goes on to the general election. Miller says he’s been called by as many as eight people interested in the race, said Miller. Half of the House vacancies in Howard County are in the redrawn District 12. Democrats Liz Bobo, in single-member 12B, and Steve DeBoy and Jimmy Malone, in two-member 12A, which includes their Baltimore County homes, all announced their retirement, then bestowed their unanimous endorsement on Terri Hill, a Columbia plastic surgeon with long family involvement in Howard County politics. Lam has worked on health policy for liberal Congressman Henry Waxman on Capitol Hill, and has been a legislative aide to Del. Dan Morhaim, the only physician in the state legislature, where Lam has clearly made a lot of friends. On Saturday, a Montgomery County fundraiser is being hosted for Lam by Morhaim, House Majority Leader Kumar Barve, Del. Aruna Miller and a long list of Asian-Americans active in politics. The three open seats in a Democrat-heavy district is expected to attract eight, 10, a dozen candidates or more. On Friday, Brian Bailey filed for the race, launching his campaign with a professionally produced six-minute video (and an equally sophisticated website) that touches all the bases: health care, education, transportation, environment, unions, veterans and seniors. Bailey, 28, came in fourth and last in the Democratic primary for Baltimore County Council in 2010. He is a former chairman of the Baltimore Democratic Party Central Committee and a cancer-survivor “in remission,” he says. 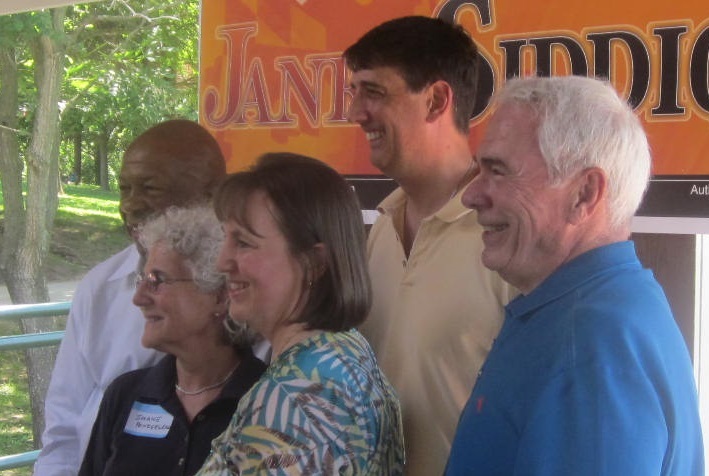 “Whether protecting the Chesapeake Bay and our motorists or preserving our state’s Triple AAA bond rating, Jimmy, Liz and Steve have commendable records of service and deserve our sincerest appreciation,” Bailey said. Eric Ebersole, a Catonsville resident who teaches math at Marriott’s Ridge High School in Howard County, has also filed for a District 12 House seat. Former Del. Mike Gisriel is eyeing the race, though he’d have to move into District 12. He may have “a formal announcement” in July. Gisriel, now an Annapolis lobbyist, served one term in the House representing a Towson area district, but was defeated in a close reelection bid in 1990. That year, one of the candidates he defeated in the Democratic primary was Guy Guzzone, who went on to bigger things when he moved to Howard County, serving as an aide to County Council member and then Del. Shane Pendergrass, before being elected himself to the County Council and House of Delegates. Guzzone’s personal decisions have helped shape the 2014 electoral landscape in Howard County. First, he decided not to run for county executive to succeed his friend Ken Ulman and, earlier this month, he decided to run for Robey’s seat, opening up another House slot. Just a few days later, school board member Janet Siddiqui, who had already announced she would run in District 13, was added to the Team 13 slate of Guzzone, Pendergrass, vice-chair of the Health and Government Operations Committee, and Frank Turner, vice-chair of the House Ways & Means Committee. “We couldn’t think of anybody better to bring the skills needed,” Guzzone said in announcing the endorsement at a Siddiqui picnic June 13. Siddiqui, a pediatrician with Johns Hopkins Medicine, has not just skills and public service experience. “She had great numbers” in her races for school board in 2008 and 2012, said Rep. Elijah Cummings, the Baltimore congressman who has become something of the godfather of Democratic political endorsements, backing Hill as well. Siddiqui was the top school board candidate in 2012, getting 68,000 votes running county-wide for reelection. That’s 2,000 more votes than County Executive Ulman got when he ran for reelection in 2010. Guzzone got the most votes for delegate in District 13. While no Republicans have filed in Districts 12 and 13, Howard County Republican Party chairman Loretta Shields said she expects a full slate of candidates come the February filing deadline. Maryland education officials and lawmakers, members of the state’s first commission to review standardized testing, appeared ambivalent on Tuesday about how they will determine the value of statewide assessments. Some commission members wanted to look at the technology infrastructure for testing, while others want to further study the ancillary effects on students — such as school computers being used for exams instead of instruction.